It’s October! I’m completely obsessed with the fall for so many reasons, but probably the biggest reason is FOOD! I can’t stay away from it. I’m a comfort food junkie and if I’m not careful I could literally gain ten pounds before Thanksgiving in creamy soups, PSL, and decadent desserts. Did I tell y’all yet that since July when I’ve been hitting the gym hard until now I am down 11 pounds and 8.5 inches (and counting)? I’m so proud of myself and I’m trying not to let my love of cold weather foods ruin my weight loss streak. I’m trying to keep my crockpot going most days with healthy foods and I’m experimenting a little bit here and there with desserts but trying not to go completely insane and cracked out on sugar and carbs. And that my friends, is how this recipe was born. Buzzard Billy’s in La Crosse, WI is my favorite restaurant of all time. They have the most amazing bread pudding there that is such a treat to have whenever I’m there and I’m completely obsessed with the warm, gooey sweetness that is bread pudding. The caloric splurge, however, is not worth it to me. 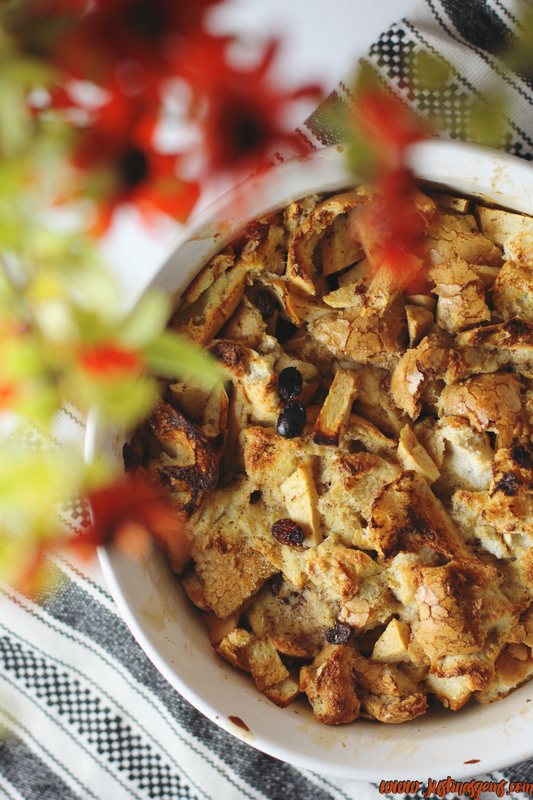 It turns out that apples, raisins, and ooey-gooeyness can meet in a low fat environment and taste just as satisfying! 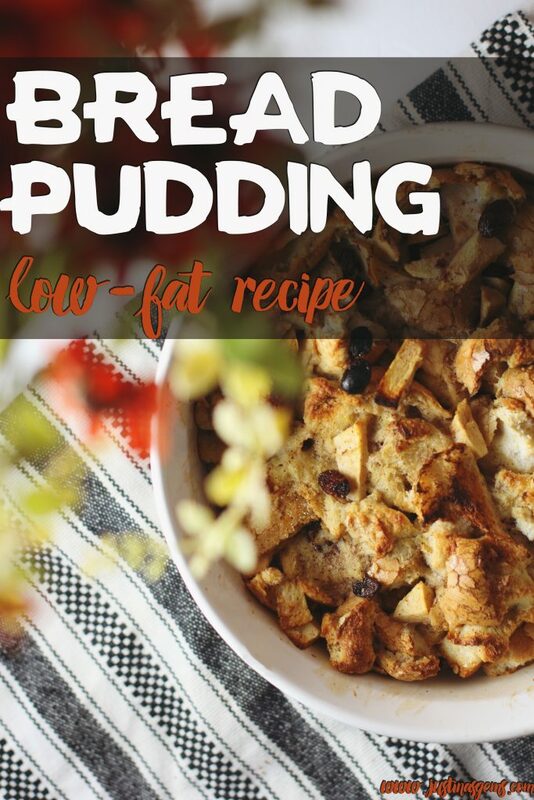 A delicious low-fat take on a decadent dessert. Preheat oven to 350 degrees, and start boiling water in a kettle. Find a large roasting pan and a baking dish that fits inside. Break the french bread into small pieces in the baking dish (mine is a Corningware 3 inch deep, 9 inch round baking dish) Mix in the raisins and the apple. Combine eggs, milk, sugar, cinnamon, and vanilla extract in a mixing bowl. Pour the mixture over the bread until it's covered evenly in the mixture. 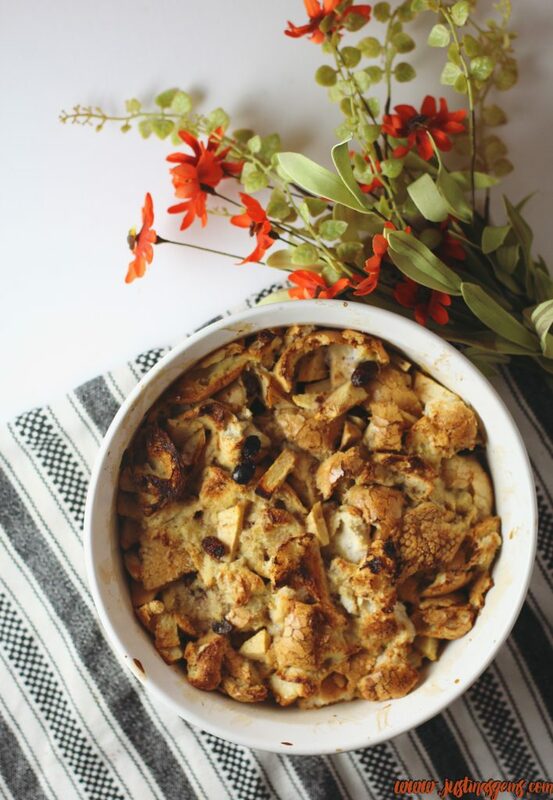 Place the bread pudding baking dish into the large roasting pan. Carefully pour the boiling water from the kettle into the roasting pan, so it's as though the boiling water is a moat between the roasting pan and the baking dish. Bake for 45-60 minutes in the oven. 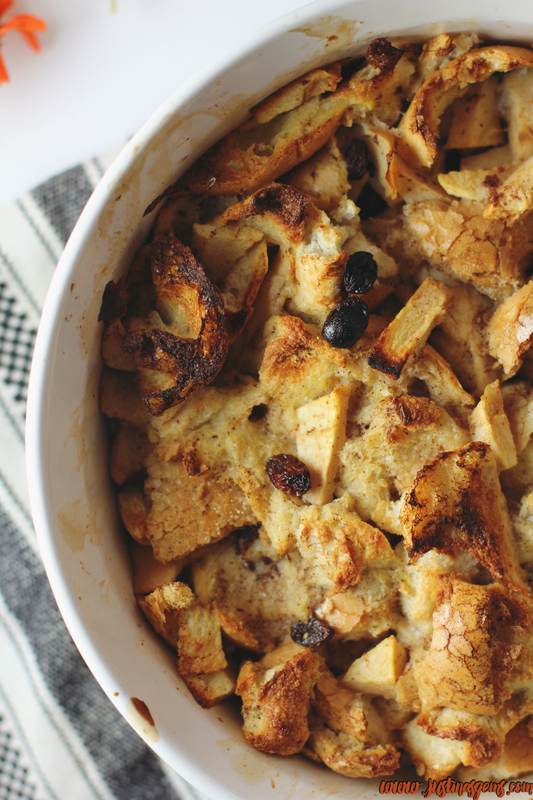 When it's done a knife inserted into the center of the bread pudding will come out mostly clean. The center should be somewhat gooey and the outer part should be somewhat crispy. Enjoy warm or cold, and it's delicious with the addition of some skim milk poured into your bowl or even ice cream! It's great on its own too. 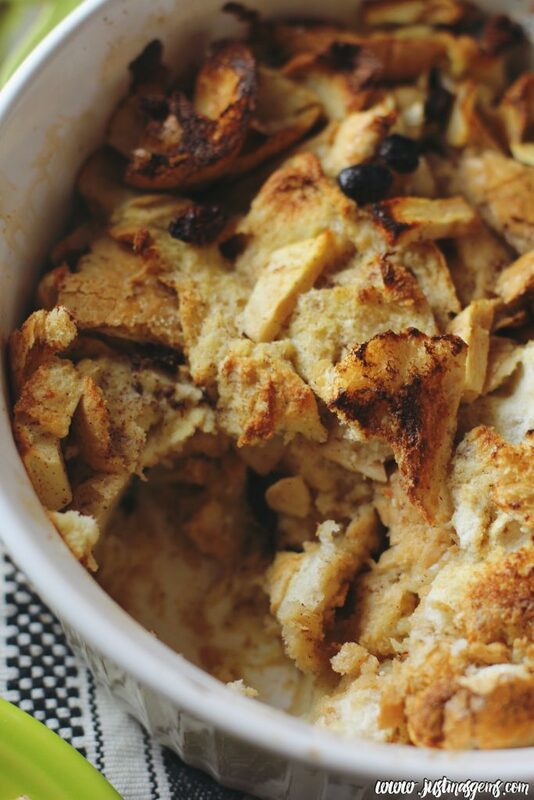 If you want the bread pudding even richer, try adding butter to the bread, raisin and apple mixing step. So good! I‘ve already made this bread pudding recipe twice this weekend and I’ve eaten an embarrassing amount. Thankfully, it has way less fat and sugar than most versions of this that I’ve had and it’s totally hitting the spot. I’m happy to say we are halfway through the weekend and I can still zip my pants! Woohoo! 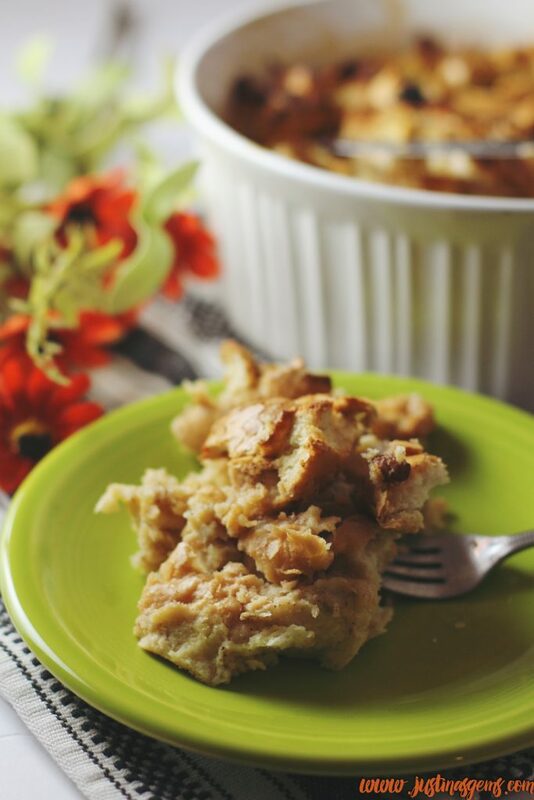 Do you have a favorite fall dessert that you’ve made a healthier version of? Please share in the comments and send me links! This was very good!! I have to be on a very low fat diet due to health reasons, and have missed baked goods. So glad to find a bread pudding recipe that doesn’t use butter or cream! I used two whole eggs and then four egg whites to decrease the fat content even more, and my whole family liked it, including a very picky teenager. THANK YOU very much! Yay, I”m so glad it worked for you! I need to revisit this recipe myself this fall!